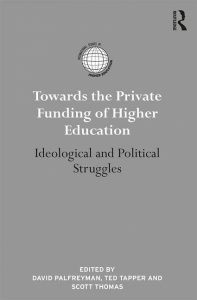 Marek Kwiek published a chapter (“Robust Privateness and Publicness of Higher Education: Expansion Through Privatization in Poland”) in a book recently edited by David Palfreyman, Ted Tapper and Scott Thomas: Towards the Private Funding of Higher Education. Ideological and Political Struggles (London and New York: Routledge, 2018, pp. 90-11). The book is available here and the chapter (in PDF) is available here. Privatization of higher education is closely linked to its expansion: when systems expand, there appears a fundamental question of how to fund them from the public purse. The growth of higher education in Poland under the communist regime (1945–1989), and especially in the 1970s and 1980s, was frozen: enrolments were stable and higher education was largely inaccessible. Privatization following the 1989 regime change had two crucial dimensions: ideological (accompanying massive privatizations in the economy in general) and financial (financial austerity affecting all public sector services). The financial dimension of privatization was more important, and it was accompanied by a general lack of interest in social policies from policy-makers in the midst of large-scale economic reforms. The two main types of privatization are external privatization (the booming private sector) and internal privatization (fee-paying courses in the nominally free public sector). ‘Education can be privatized if students enroll at private schools or if higher education is privately funded’ (Belfield & Levin, 2002, p. 19); Poland provided examples of increasing private provision and increasing private funding in both sectors. Belfield and Levin (2002) argued that ‘the first factor to explain privatization in education is simple: many parents want it’ (p. 29). Polish students (and their parents) clearly wanted higher education; consequently, as elsewhere in Central Europe, ‘private higher education provide[d] stark solutions to the dilemma of how to keep expanding access while not expanding public budgets’ (Levy, 2008, p. 13). In discussing privatization in higher education, the Polish case study is important for two reasons. First, Poland has been the European country with the biggest private sector enrolments. Expansion through privatization in 1990–2005 was a successful experiment of increasing participation through a demand-absorbing private subsector, using private rather than public funding. Second, Poland shows the powerful role of changing demographics and stable politics in the changing public-private dynamics in higher education. Once the champion of privatization, Poland—through a combination of demographic and political factors—became a radically de-privatizing system in which expansion and privatization were replaced by contraction and de-privatization. Between 2009 and 2015, the number of private providers shrank from 330 to 265; private sector enrolments in 2006–2015 fell by half, from 660,000 to 330,000 students; and the role of fees in the public sector and in the national system declined significantly, with the number of fee-paying students in both sectors declining by half, from 1.14 million (2006) to 0.56 million (2015). The demographic factor was predictable—but political willingness to support the public sector expansion was not. In a zero-sum game in which students are either publicly financed or privately financed, privatization processes in higher education have been slowing down for a decade now, and de-privatization processes are expected to intensify. Expansion through privatization emerges as being highly sensitive to demographics and public funding; when the student population is contracting and the state is willing and able to keep financing the shrinking public sector, the private sector is doomed. Rare as it is today, de-privatization and contraction of higher education is an interesting trend in otherwise globally privatizing and expanding higher education.